Miguel Pallardo should return to action with Hearts before the end of the month after seeing a specialist in London. Doctors have confirmed that the Spaniard’s Achilles injury is not serious and told him to rest for another week before resuming light training. Provided he suffers no setbacks, he should be fit to play again by the end of the month. Hearts are keen to have the influential midfielder available after he missed last week’s season-opening 4-3 win over St Johnstone. Pallardo became a favourite with supporters after arriving from Levante last September but his pre-season preparations were hindered by the Achilles problem. He saw a specialist in Glasgow last week before travelling to London on Wednesday for another assessment, which has brought positive news. 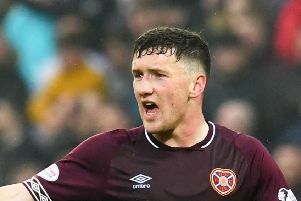 He could come into contention for matches towards the end of the month, when Hearts play Forfar in the League Cup and Hamilton Academical in the league. However, coaching staff at Riccarton are determined not to rush him back into matches until he is 100 per cent fit. Kevin McHattie underwent minor surgery to correct a nose injury yesterday, but he is due to train today. One player who could play earlier than expected is recent signing Juwon Oshaniwa. He is pushing for a starting place in the Hearts team for tomorrow’s trip to Dundee. Head coach Robbie Neilson revealed that the Nigerian left-back has been impressive in training since arriving last week. Neilson added that he is happy with his signings and does not plan any more new recruits in this transfer window unless a player is sold. “Unless we get any reasonable offers for anybody and they’re going to go, then there will be nobody else coming in. I’m happy with the squad we’ve got,” he said. Neilson wants Hearts to use their unpredictability to their advantage while they remain something of an unknown quantity in the Scottish Premiership. “We still have that unknown quantity, which is good for us. We found last year that, after the first and second round of games, everyone gets to know each other. Hopefully we can take advantage of the early stages of the season.